Put de-shelled eggs in different fluids and watch them swell and shrink. Use a giant cell—a de-shelled chicken egg—to explore the comings and goings of cellular substances. De-shell the eggs by placing them in a large container so that they touch as little as possible. Add vinegar to cover the eggs (see photo below), and cover the container. Allow the eggs to sit for 24 to 48 hours at room temperature. Note: Changing out the vinegar halfway through and replacing it with fresh vinegar will speed up the process. Determine the treatments you’ll be using on your eggs, and prepare the substances you’ll need. You can make salt-water solutions by dissolving different amounts of table salt in containers of water (e.g. 100g, 200g, 300g of salt (NaCl) per liter). You can make solutions of food coloring by adding a few drops of each color into containers of water. Remember to label your containers as you work. 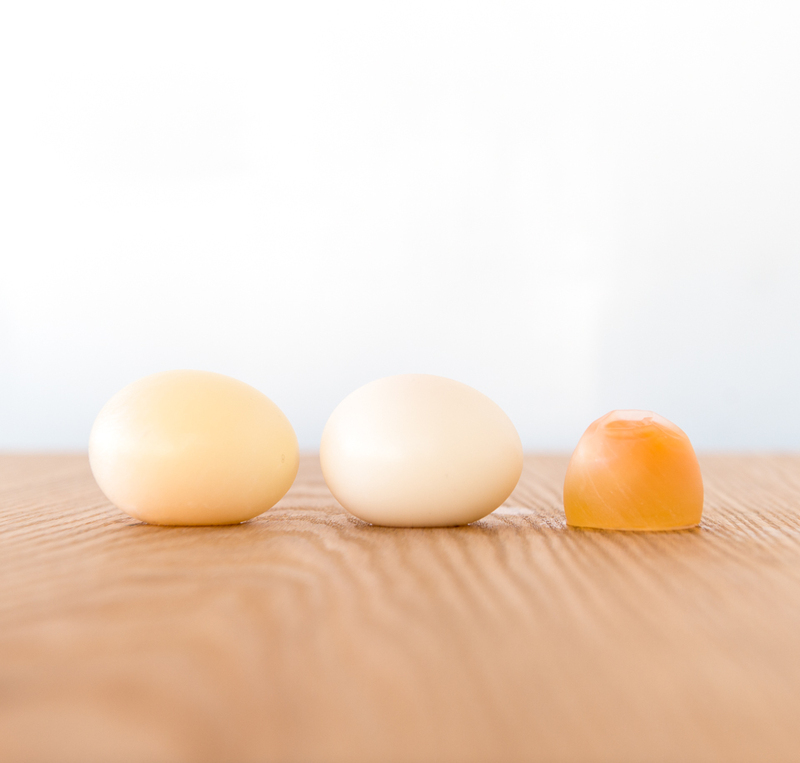 Use a scale to find the mass of each de-shelled egg before treatment. Record the result on notepaper. Place one egg in a labeled container and cover it with your chosen treatment. (If the egg floats, you may use something to hold it down, such as a glass jar; see photo below.) Repeat for each of the remaining treatments. Be sure to set aside an untreated "control" egg. After taking its mass, cover the control egg with plastic wrap, and set it in a container alongside the treatment eggs. Place the treatment containers somewhere they can sit for at least a day at room temperature. Observe any changes that occur in the eggs during the first hour or so of soaking and record your observations. Observe any changes in the color, size, or shape of your experimental eggs. Record your observations. Then, gently remove your sample eggs from their treatments to measure and record the mass of each one (see photo below). Remove the plastic wrap from the control egg and measure its mass too. Calculate the percentage change in mass for each egg by dividing the final mass by the starting mass and multiplying by one hundred percent. In a separate bowl, carefully dissect the egg by piercing the membrane. Record your observations. How did each egg change? Did its mass increase or decrease? Do you see anything in common with the treatments that enlarged the eggs? Which treatments made the eggs shrink, and which did not? In general, the most dramatic changes to the mass, color, and shape of the eggs will occur within the first 24 hours of the experiment. Eggs submerged in corn syrup will have lost considerable mass and have the appearance of flabby sacks. Eggs soaked in distilled water will gain mass and appear dramatically swollen. Eggs in dilute salt solutions will gain mass, and even those in very concentrated solutions might gain mass. Eggs buried in salt or other dry media should lose mass. The de-shelled eggs serve as good models of human cells. After the eggshell is removed, a thin membrane (actually, two membranes held tightly together) remains. This membrane, like those in human cells, is selectively permeable, allowing certain substances to pass through while blocking others. Substances that can pass easily through the membrane of the egg will follow the principles of diffusion. They will move through the membrane from the side where they are at a higher concentration to the side where they are at a lower concentration (click to enlarge the diagram below). This movement will continue until the concentration on both sides is the same. While random molecular motion will cause individual molecules to continue moving back and forth across the membrane, the overall concentration on each side will remain in equilibrium, with equal concentrations on both sides. The egg’s membrane is permeable to water. 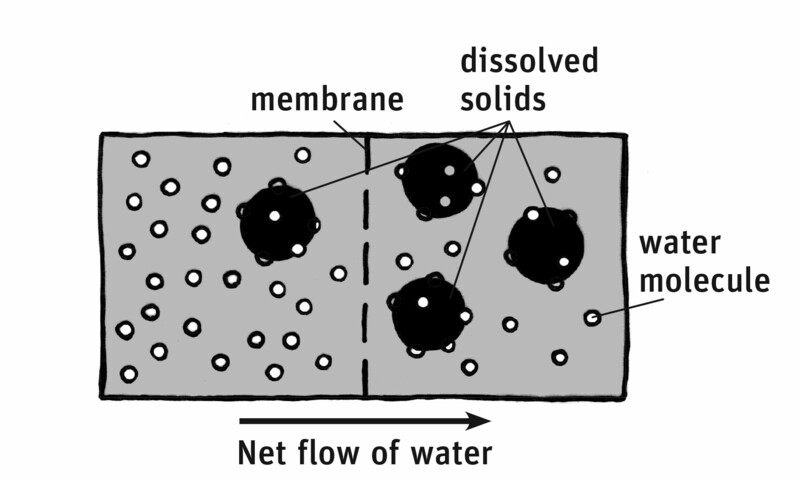 Movement of a solvent (such as water) across a semipermeable membrane from a less concentrated solution to a more concentrated one is called osmosis. When an egg is soaked in a solution that has a higher solute concentration (the relative amount of dissolved stuff) than the solute concentration inside the egg, water moves out of the egg and into the solution (see diagram below). As a result, the egg loses mass and ends up looking deflated. An egg naturally has a lot of stuff inside, so the outside solution has to be very concentrated for this to happen. That’s the case when an egg is treated with corn syrup or buried in salt. By contrast, when an egg is treated with distilled water, or a dilute salt solution, the solute concentration is higher inside the egg than out, so the water moves into the egg, increasing its mass. It may be easier to think about osmosis in terms of water concentration rather than solute concentration. If the solute concentration is high, then the water concentration will be low by comparison. Rubbing, or isopropyl, alcohol is at least 70% alcohol and therefore less than 30% water. This should cause water to move from the egg into the solution, and the egg should lose mass. In addition, the egg may appear white and rubbery. Alcohol that diffuses into the egg can denature the proteins, unraveling their three-dimensional structure and causing them to coagulate or join together. Egg proteins turn from translucent to white when they are denatured. In cooking, temperature is used to denature these proteins, but you may have noticed that alcohol has also "cooked" the egg and caused it to look hard-boiled. The plasma membranes of your cells behave much like those of the egg. All of the trillions of cells in your body are like busy seaports with materials coming in and going out. Water, oxygen, and nutrients must pass through the plasma membrane into your cells, and wastes must leave. When the concentration of oxygen is higher in your lungs than it is in your blood, for example, the oxygen diffuses into red blood cells through capillary walls. Your flowing blood then transports that oxygen to your tissues. From there, the oxygen diffuses into other cells to be used in cellular respiration. Through a similar process, water in the stomach moves into the bloodstream and is then carried to the cells, where it supports a variety of essential bodily functions. Predict what would happen if you placed the shrunken eggs in plain water overnight. Do the experiment and explain your results. In this activity, not only can you measure how much material moved into or out of a treated egg, but you can also chemically determine whether molecules moved across the membrane. If you break the egg into a dish, or save some of the soaking solution, you can use chemical tests to see what’s there. For example, you can use Benedict’s solution to test for simple sugars, iodine to test for starch, or Biuret solution to determine whether or not protein exited the egg as it soaked. When using this activity with large groups of students or multiple classes, have each group apply only one treatment, and then analyze the data collected from all groups. Having each small group design an experiment with one egg will allow you to do the activity with fewer eggs per class, and collecting several sets of data will enable students to identify any outliers. This Snack is an excellent activity for introducing diffusion, osmosis, and the semipermeability of membranes and allows learners to engage in the NGSS Science and Engineering Practices. By collecting data from multiple classes, you can facilitate a discussion about what and how much data is necessary to count as evidence. Students can also use the evidence about what and how much material moves into and out of the egg to formulate a revisable model about how osmosis occurs and what might prevent or allow molecules to move through membranes. By incorporating related activities, such as the Cellular Soap Opera Snack, students can form a more complete conceptual model of the cell membrane and how molecules move along concentration gradients. Note that it’s also important to discuss the idea that models such as this one have limitations. There are structural differences between the membranes of chicken eggs and human cells that result in differences in permeability. Some of the molecules that pass through the egg’s membrane in this activity would not pass through a human cell membrane because of their size (such as cornstarch) or their charge (such as Na+ and Cl- from the salt).